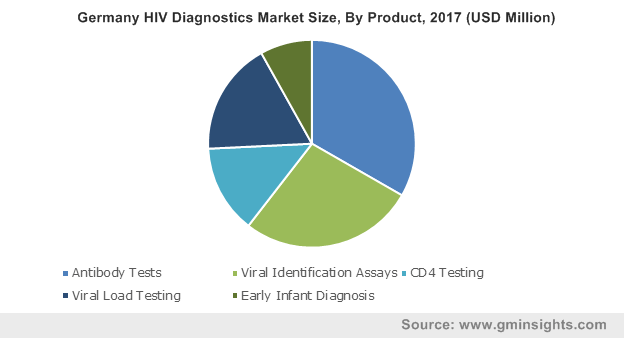 HIV diagnostics market size was valued at USD 2.9 billion in 2017 and is expected to witness 8.7% CAGR from 2018 to 2024. 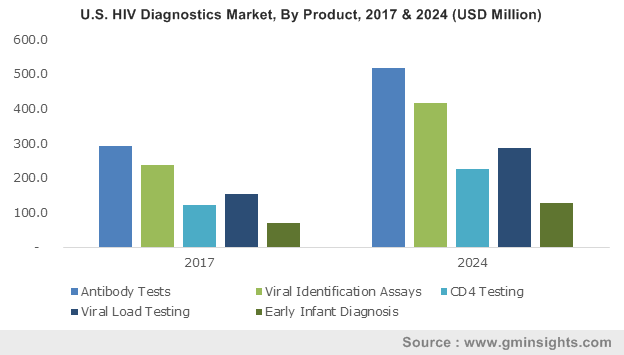 Increasing prevalence of HIV infection worldwide will majorly boost HIV diagnostics market growth over the forecast period. HIV infection is one of the leading causes of morbidity and mortality. As per the UNAIDS’s data more than 36.7 million people across the globe were living with HIV in 2017. Around 1.8 million children aged below 15 years had HIV infection. Additionally, many were infected by their HIV-positive mothers during pregnancy, childbirth or breast-feeding. Growing incidences of AIDS especially in the developing and underdeveloped economies will offer several growth opportunities in HIV diagnostics resulting in industry growth. Favorable regulatory landscape for HIV diagnostics will render positive impact on business growth. The U.S. FDA assesses performance and clinical value of blood screening and HIV diagnostic assays. It conducts regulatory study to create product standards and develop improved diagnostic methods to examine safety of biologics and drugs. FDA's multi-disciplinary research programs plays an important role in the development of test kits, vaccines, and therapeutic agents for use in AIDS and related conditions. Hence, government support coupled with favorable reimbursement scenario for HIV diagnostics will further accelerate HIV diagnostics business growth. Furthermore, advancements related to HIV testing of blood products and donated blood to prevent HIV prevalence through blood transfusion has led to increased number of blood transfusions and donations. Adoption of diagnostic tests for testing donated blood and blood products as per the set standards to avoid spread of diseases has increased in recent years. Efforts of various organizations such as World Health Organization (WHO) and National Aids Control Organization (NACO) to promote safer blood donations and transfusion will further increase the demand for such tests thereby, augmenting business growth. However, limited access to HIV diagnostics in low-income or underdeveloped countries may hamper business growth to certain extent over the forthcoming years. Antibody tests segment held largest revenue share of 33.5% in 2017 and is estimated to show significant growth over the forecast period. Growing awareness among people pertaining to regular blood tests and growing prevalence of HIV symptoms will fuel business growth. Increasing cases of HIV infected individuals with high viral loads and rapid disease progression should boost business growth. Increasing mortality rate and inadequate HIV specific immune response will increase the demand for antibody tests thereby, surging revenue size. Early infant diagnosis segment is anticipated to witness lucrative CAGR of 8.9% during the forecast timeline. Growing risk of death of infants (before the age of 2 years) amongst HIV-infected infants, advancements in pediatric antiretroviral treatment and development of national programs to provide early virological testing of infants for HIV will boost early infant diagnosis market in the coming years. Moreover, increasing awareness towards identification of uninfected but HIV-exposed infants coupled with rising demand for prevention measures and follow-up care to ensure that infant remains uninfected will boost segmental growth. U.S. HIV diagnostics market dominated North America region with 77.7% revenue share in 2017 and is estimated to show similar trend over the forecast period owing to increasing prevalence of HIV infection. According to the Centers for Disease Control and Prevention (CDC) in 2015 more than 1 million people in the U.S. were living with HIV. Additionally, in 2016, around 39,782 people were diagnosed with HIV infection. Favorable regulatory scenario for HIV diagnostics in the U.S. and high healthcare spending should further spur U.S. HIV diagnostics market size. India HIV diagnostics market accounted for considerable revenue in 2017 and is expected to show robust CAGR of 10.0% over the coming years. As per UNAIDS the third largest HIV pandemic in the world is in India with around 2.1 million people living with HIV. Various government initiatives such as National AIDS Control Program (NACP) introduced by the National Aids Control Organization (NACO), a division of Ministry of Health and Family Welfare for HIV prevention and control among the high-risk population should further boost HIV diagnostics business growth. South Africa HIV diagnostics market was valued at USD 9.1 million in 2017 and is projected to show lucrative growth over the forecast timeline. The growth can be attributed to high prevalence of HIV infection in South Africa due to unmet healthcare needs in the country. According to the UNAIDS data, South Africa has the biggest HIV pandemic in the world. Around 7.2 million people were living with HIV in 2017 thereby, increasing the need for HIV diagnosis. Additionally, HIV diagnosis improvements in recent years for instance, initiatives such as the U.S. President’s Emergency Plan for AIDS Relief (PEPFAR), will render positive effect on the industry growth. 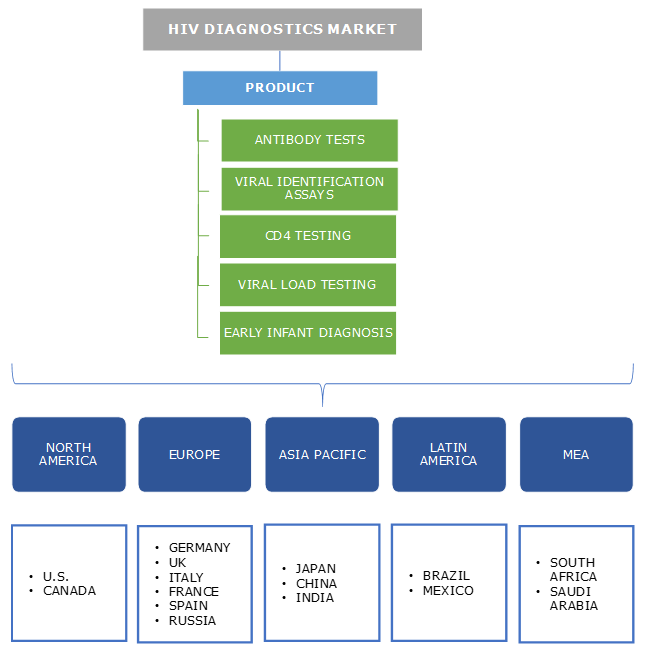 Some of the key industry players operational in the HIV diagnostics market include Abbott Apogee Flow Systems, atomo diagnostics, BD Biosciences, Beckman Coulter, bioMerieux, Cepheid, ChemBio Diagnostics, Daktari Diagnostics, Hologic, Merck, PointCare Technologies, Qiagen, Roche Diagnostics, Siemens Healthineers and Sysmex Partec. Industry players implement certain strategic initiatives such as merger, new product launch, acquisition and partnerships that help them in strengthening their market position. For instance, in July 2016, Merck acquired IOmet Pharma Ltd., a privately-held UK-based drug discovery company. The acquisition enabled company to enhance its immuno-oncology sector offering through IOmet’s immunotherapeutic candidates. Availability of such advanced products helps to strengthen company’s existing product portfolio and render company with sustainable profits. In the early 1980s when the Centers for Disease Control and Prevention (CDC) coined the term 'AIDS' (Acquired Immune Deficiency Syndrome) for a disease occurring in person with unknown cause for weakened resistance to that disease, that is discreetly predictive of a defect in cell mediated immunity. Since the beginning of the AIDS pandemic, more than 70 million people in the world have been infected with HIV infection and around 35 million people have died of HIV. A major concern during the early AIDS epidemic was the absence of a test to recognize individuals affected with the virus. The first HIV antibody test was developed in 1985, to screen blood products and not for the AIDS diagnosis. The first-generation assays could detect IgG antibody and become positive after 6 to 12 weeks of infection. This resulted in false-positive results at times that led to the development of two-test algorithm using immunofluorescence test or Western blot as a confirmatory procedure. The second-generation HIV test included recombinant antigens whereas the third-generation HIV tests comprised IgM detection with an aim to reduce test-negative window to approximately 3 weeks after infection. Fourth and fifth-generation HIV assays involved p24 antigen detection to the screening assay thereby, minimizing test-negative window to 11-14 days post-infection. Further, a new algorithm addressed fourth-generation assay's ability to identify both antigen and antibody but lacked the ability to differentiate between them. Fifth-generation HIV assay offers separate antibody and antigen results and enables detection of HIV infection, approximately 2 weeks after exposure, with a reduced number of false-positive results. Such advancements in HIV diagnostics to offer highly sensitive, accurate and reliable tests should foster business growth. Increasing focus of government and industry players in AIDS management and treatment will surge HIV diagnostics industry growth in the coming years.